People commonly attempt short-term fasts to lose weight and rid the body of excess toxins. While many people have success with water fasts (eating nothing and drinking only water for a period of time), others prefer to drink fruit and vegetable juices during the fast. 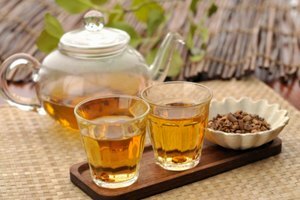 A juice fast that also contains herbal teas can cushion the release of toxins, making the fast more endurable, therefore more successful. Ginger, because of its common use in aiding digestion, has long been made into a tea that can be very useful in supporting the body as it cleanses itself during a fast. Common ginger (Zingiber officinale) is a fleshy, knobby rhizome (a stem that grows underground). The ginger plant has long, strappy leaves and inconsequential flowers. For more than 4,000 years, ginger has had important medical and culinary uses in Chinese, Indian and other Asian cultures. According to the University of Maryland Medical Center, "the important active components of the ginger root are thought to be volatile oils and pungent phenol compounds (such as gingerols and shogaols)." Today, people use ginger to alleviate nausea, diarrhea, other stomach ailments, including colitis, and to relieve cold and flu-like symptoms. Ginger is well-known to be spicy. Practitioners of Ayurvedic medicine (traditional medicine native to India) believe that ginger activates the body's inherent heat to burn off excess toxins, especially useful during a fast. Ginger's heat-giving properties are also used to treat frostbite and muscle stiffness. It's easy to make your own ginger tea. Start by peeling a two-inch long piece of ginger root and slicing it thinly, grating it, mincing it, or grinding it with mortar and pestle. Use whichever method you prefer; the object is to expose as much surface area as possible. Bring four cups of water to a boil, add the ginger, cover, and reduce the heat to simmer for 15 minutes. Strain the tea and add a drizzle of honey and a spritz of lemon to taste. To vary the flavor, use lime juice instead of lemon. Try sprinkling a bit of cayenne pepper to increase the heat. According to the FDA, ingesting herbs and other natural remedies, including ginger, can have adverse effects on people, including those who take some prescription medications. If you are pregnant, breastfeeding, have ongoing medical conditions, are taking prescription medications, or have diabetes or low blood sugar, consult your doctor before starting any herbal regimen or any fasting regimen. 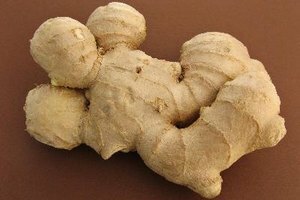 For other health benefits of ginger, read http://www.healthdiaries.com/eatthis/10-health-benefits-of-ginger.html.